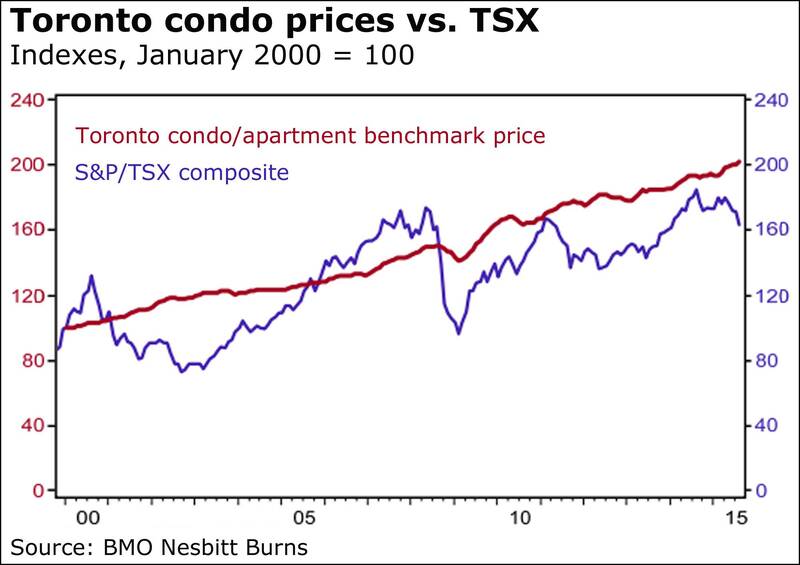 "Given Toronto’s renown for condominium development, here’s an interesting finding from BMO Nesbitt Burns: Investors would have done better with condos than TSX-listed stocks over the past 15 years. “Since the start of the millennium, Toronto condo prices have marched steadily higher (outside of a brief dip during the recession), averaging yearly gains of 4.6 per cent and besting the more volatile TSX,” said BMO senior economist Sal Guatieri. Mr. Guatieri’s findings, illustrated above, don’t include total returns on either investments, but he believes condo investors would still have come out ahead given relatively higher capitalization rates in the former compared to dividend returns for the latter. “Condo investors have outperformed shareholders for the past 15 years while experiencing less volatility,” Mr. Guatieri said. Annual resale price gains in the Toronto condo market, by the way, were measured at 6.8 per cent in the second quarter, hitting an average $453 per square foot, according to Urbanation, which tracks the sector. Price increases for new units were a much more tame 2 per cent, while gains on the rental side were 4.6 per cent, for an average $2.48. Notably, the number of leases surged 22 per cent from the same period last year, while sales climbed 21 per cent. There were more than 17,700 units unsold at various phases of development."